TreesCharlotte holds dozens of events each planting season, which lasts from October until early April. One of our primary areas of focus is planting trees in underserved communities. 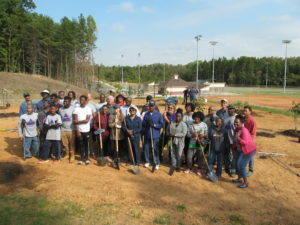 In the past, we’ve partnered with Renaissance West Community Initiative to plant trees, created a community fruit orchard at Friendship Missionary Baptist Church and planted at numerous high-poverty schools in Charlotte. Do you work with a non-profit that needs trees? It could be a church or a charter school or a local non-profit. We would love to work with you! Fill out this interest form and we’ll be in touch. Please share any specific requests here, if not covered above.